Soon after the women's march, which focused on seeking equal rights and opportunities for women and issues of women's safety, some men could not take it anymore and decided to start their own protest using outrageous placards. The Aurat Azadi March in Pakistan, held on International Women's Day, evoked pretty strong reactions in the country where oppression of women and gender equality continue to remain pertinent issues. And now, images of a retaliatory 'Mard March' are going viral. Even though the efforts of the thousands of women along with queer persons and heterosexual men who took to streets across Pakistan on March 8 were widely applauded, the march has also kicked up a furore in Pakistan. Many orthodox and patriarchal sections of Pakistani society have objected to the placards and slogans that the marchers exhibited as "vulgar". Soon after the women's march, which focused on seeking equal rights and opportunities for women and issues of women's safety, some entitled men in Pakistan could not take it anymore and decided to start their own protest using outrageous placards. A number of them were posted by Facebook page FHM Pakistan on March 11. The words on the placards included messages like "Ladies First, gents first kab ayega?" ('Ladies First', when will we have 'Men First?) and 'Moza choro, dupatta dhundo" (Quit the sock, find your scarf). We compiled some of the misguided and extremely sexist posters. The post was shared over 27,000 times on Facebook. Many people including men as well as women seemed to consider it a "befitting" response to the women's march. However, soon social media was filled with criticism of the posts. Many called it a regressive and entitled response to women seeking basic rights in a country that is historically low on gender-quality metrics. This is not Mard March, this is Shadeed Qisam ka Dard march. Lmaooo... what a joke men are.. in an already patriarchal country they went out for Mard March. I'm sure they will be holding all the licentious placards to ridicule women so that male fragile ego can be sated. The images were also wildly trashed by men women alike on Facebook. Sample some of the comments. Whether the march actually happened or whether these were just photographs taken by individuals andthen collated by a Facebook page could not be ascertained. However, Pakistani comedian Shehzad Ghias Shaikh took on the online campaign. In a satirical take, he released a number of fake 'Mard March' posters and circulated them on social media through his Instagram account. The fake posters caused quite a bit of confusion with many mistaking the images to be actual placards that were sported by male protesters. In a tweet threat on Mar 23, the comedian disclosed that his intention with the fake images and fake information regarding the alleged march were meant to mislead people who were interested in Mard March and to turn it into a joke. Reports of gender inequality are not unheard of in Pakistan. According to Georgetown Institute for Women, Peace and Security's Women, Peace, and Security Index (2017), Pakistan is the fourth most unsafe country for women. Free mixing of genders and empowerment of women in terms of employment, marriage and choice of clothes is still considered taboo by many. Just recently, a professor in Pakistani college was stabbed by a student for trying to organise a farewell party for students in which both men and women were invited. He was stabbed by the accused, who has since pleaded guilty, as the latter considered the Professor's act "blasphemous". In recent years, several women's rights activists and feminist organisations have come up in Pakistan. The sheer volume of participants in the Aurat March and the wonderfully bold posters that were displayed are proof that conversations about gender are undergoing a change. Reactions such as the "Mard March" may end up defeating the whole purpose of discussing gender equality. 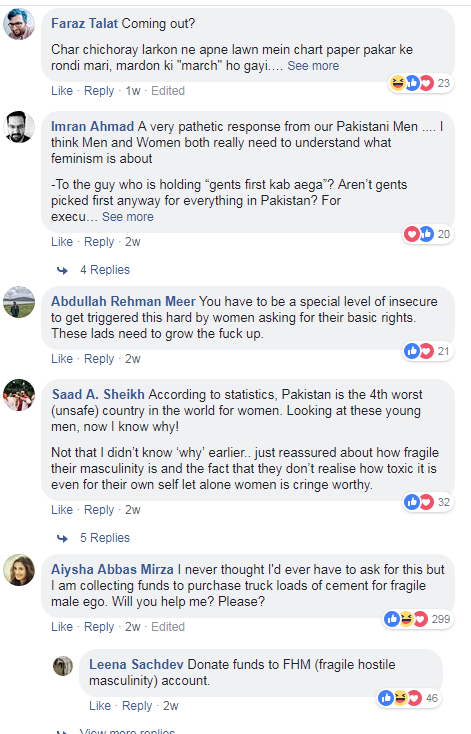 But the intense trolling and subsequent debunking of the reactionary idea point to a gradual yet visible change in the way women's rights are perceived in Pakistan.